This presentation of the rules with diagrams has only recently been put on the site: please send any error reports to us. A note on the diagrams and vocabulary. 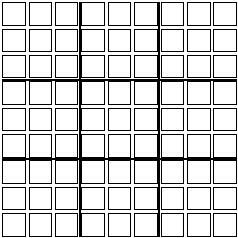 The board has nine borderlands (or areas) of nine squares or positions each. The line between each borderland is called a border. At the start of the game each of the eighty one positions has a neutral (non-coloured) tile.